There is a wide selection of paintbrushes available to choose from and which you should choose depends on a number of factors. Check out our top tips on how to go about making the best choice for decorating your home. The makeup of your paint helps to determine what type of paint brush should be used for the most aesthetically pleasing and efficient finish. As a general rule of thumb it is best to select synthetic bristles when applying a water based paint and natural bristles with oil based paints. It may seem obvious, but as a general guide you should choose a larger paint brush for painting larger surface areas and smaller brushes for applying paint to a smaller space. If you are repainting a door for example, you may wish to use a slimmer brush to paint any indented sections surrounding the panels, before switching to a wider brush to fill in the larger remaining sections of the door. Of course, if you are painting a wall, you may prefer to use a smaller paintbrush for cutting in around the edges before using a roller to cover the bulk of the wall. 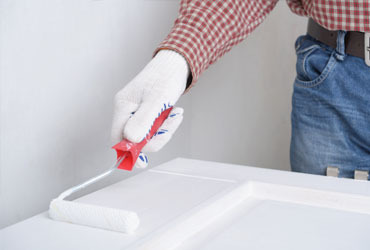 When painting straight sections such as a wall, then a square edged paint brush in most instances should do the trick. If however you are looking to tackle edges or corners then an angled edge brush may help you to achieve a neater finish. For more painting tips why not check out our blogs, How to Paint Interior Walls and Painting Your Garden Fence & Gate.